Moscow’s Red Square marched to a different tune this week, as it played host to a massive annual military music festival. The closing ceremony, which coincided with Moscow’s birthday celebrations, attracted thousands of visitors. Over 7,000 people of all ages gathered on the main square of Moscow on the fifth and closing day of the Spasskaya Bashnya festival, which started on August 31. Military orchestras from 15 countries descended on the Russian capital this year. With the number of musicians exceeding 1,500, the show this year offered an unprecedented mix of musical styles, military uniforms and parade skills. 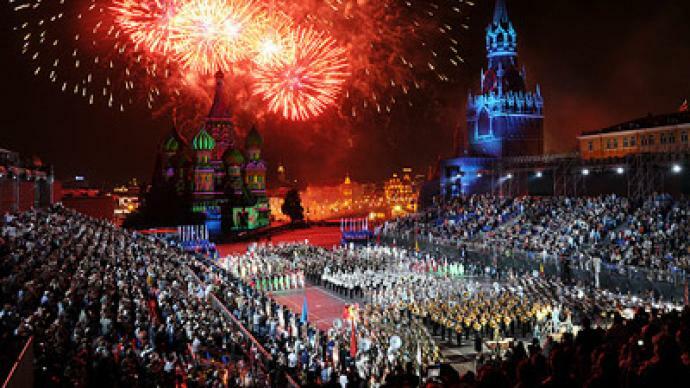 The first Spasskaya Bashnya festival rocked the city in 2009, and since then it became, some say, the most colorful military band show in the world. The parade was a very loud and bright gathering, but was far from the only entertainment being held in Moscow. The event coincided with Moscow’s 864th birthday, which was celebrated widely at over 700 festive venues across the capital. Watch the video from Red Square. The city’s center was closed for traffic and people flooded the streets to enjoy the beautiful celebrations. The new mayor of Moscow said the day would likely go down as the most expensive celebration of the city’s birthday. 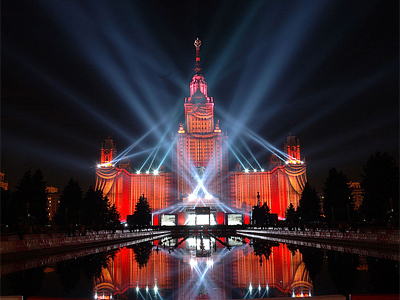 The highlight of the celebration was to be a spectacular laser show at Moscow State University, on the city’s Sparrow Hills. The event was expected to break the record for being the largest show of its kind in the world. The Guinness Book of World Records was scheduled to be on hand to register the biggest projection area in history, some 25,500 square meters. Time to lay down arms and play some music!